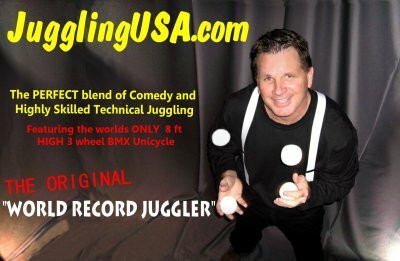 World Record Juggler / Unicyclist for hire | Professional | NATIONWIDE performances - Bio & Current WORLD RECORD Stats, etc! Bio & Current WORLD RECORD Stats, etc! 1). EXPERIENCE: With over 20 years of performing for huge crowds Bruce knows how to entertain a large crowd and get everyone involved every show! The CURRENT PROMO proves that without hesitation. Bruce can personally guarantee that he will get the crowd going louder than any other variety act out there today. 2). FREEBIES: Bruce ALWAYS hands out FREE color glossy photos after EVERY SHOW! These are ALWAYS FREE to BOTH the client and the patrons. Each patron WILL walk away with a BIG SMILE knowing they saw a great show and have a great souvenier that they will take with them. Bruce will also autograph any of them for FREE. 3). MORE FREEBIES!!! - All Volunteers (children) that appear during a performance ALWAYS receive a FREE 1 hr long DVD. These DVDs teach juggling as well as demonstrate the art of juggling! Always FREE for both the client and kid volunteers! 4). WORLD RECORD JUGGLER is a GREAT selling point for any event. This brings patrons in. This is GREAT for advertising because you just can't go anywhere and find a true "WORLD RECORD JUGGLER".... Look at the "PRESS" section for proof. "WORLD RECORD JUGGLER" originated from Bruce being the FIRST juggler to ever do 11 balls and then 12 balls. He has held JUGGLING WORLD RECORDS for a WHOPPING 17 CONSECUTIVE YEARS NOW as well! 5). Bruce performs with the WORLDS ONLY 8 Ft tall TRIPLE WHEEL "BMX" Unicycle. This unicycle attracts LOADS of attention everytime and they always wonder "How do you get up there?" and "How do you get down". There is no other one like it anywhere as it is CUSTOM made to Bruces specs. Patrons ALWAYS comment about this unique unicycle. 6). RATES: When you factor in Bruce's Experience, Quality of show, level of performance and crowd attendance numbers you will find it is a great deal for any event. Bruce ALWAYS brings his own music, mic, music and sound system along with a power generator which enables him to perform just about anywhere on the grounds or stage. 7). POPULAR: Visit Bruces YOUTUBE channel to see exactly how popular he really is. His Juggling videos have been extremely popular with his first one going well over 130,000 views already. Very few "juggling" videos hit this number. In short, I am a professional Juggler & Unicyclist for any festival, county, state, or regional fair, corporate and/or special event. I am the FIRST UNDISPUTED JUGGLER WORLDWIDE to ever flash BOTH 11 and 12 balls without a single drop! I perform 30 minute shows anywhere on the grounds or stage. My shows contain lots of comedy, audience participation and lots of highly skilled technical Juggling & Unicycling. I also perform with the WORLDS ONLY 8 FOOT HIGH CHAIN DRIVEN 3 WHEELED "BMX" UNICYCLE. The show is perfect for ALL ages including teens, seniors, 3 yr olds and everyone else! Bruce Sarafian started juggling and unicycling at the age of 10. In 1991 he tied the WORLD RECORD for ball juggling with 10 balls at once. In 1993 he was the new official WORLD RECORD HOLDER (as authenticated and listed by THE GUINNESS BOOK OF WORLD RECORDS) for the most balls (11 Balls) at once! He was very proud of this since the previous record had held since the 1930's! As a kid, he could never understand how anyone could possibly ever juggle 10 balls at once. In 1996, he broke his own world record again (12 balls without a single drop). Since then he has broken a few more world records, has held an International Jugglers Association record for many years, has appeared in several commercials, has appeared on 2 different episodes of the syndicated show "DOUBLE DARE 2000" on Nickelodeon, taped an appearance for an episode of 'Experience Eldorado' in 2009, and has been mentioned in many trivia questions including one that appeared on the TV show 'Jeopardy'. Bruce also currently performs with the worlds only 8 foot high, triple wheeled, “BMX” unicycle. Bruce has held juggling world records for 18 consecutive years now and has also been a performing juggler all over the country since 1990 entertaining huge crowds every year. * Guinness Book record holder since 1993 with 11 balls. * Broke the Guinness Book record AGAIN in 1996 with 12 balls. * First Juggler in history to ever flash both 11 & 12 balls with UNDISPUTED EVIDENCE. * First Juggler to be listed by the GUINNESS BOOK for 12 objects of ANY kind. * Won international ‘Numbers Juggling’ competitions mulitple years. * Won international 5 ball endurance competitions multiple years. * Won European 7 ball endurance competition. * FIRST juggler worldwide to juggle 5 balls for over ONE HOUR without a single drop. * ONLY juggler worldwide to ever juggle 8 balls in a complete circle with video evidence. * Current Known World Record holder for juggling 8 balls (stacked multiplex) for over the 2 minute mark without a single drop with video evidence. * One of Two KNOWN jugglers (with video evidence) able to currently juggle 10 balls (stacked multiplex cascade) for over 60 catches without a single drop. * The ONLY known juggler (with video evidence) able to currently juggle 6 balls in one hand (3 pairs) for over 5 rotations per object! Juggler & Unicyclist rendering services for for State fairs, County fairs, Regional fairs, festivals, Corporate and special events of all kinds throughout the U.S.A.